Stretchy Cord Gemstone Bead Bracelet. 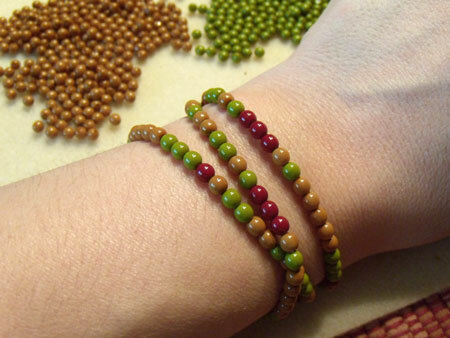 Gemstone beads and stretchy cord are a great combination for a bracelet making project that works up fast and looks terrific. Once you get the hang of working with stretchy cord, you’ll want to make up a whole armful of these cool bracelets! Leather Bubble Cuff Bracelet. I designed this project three years ago, but it’s still one of my all-time favorite bracelet making projects. I wear it as often as I can, just because I love the combination of bright neon colors and the bumpy texture of the beaded “bubbles”. Thrift Shop Beaded Bracelet. I love scouring my local thrift shops and resale shops for beaded jewelry that I can cut apart and repuprose into something new. It’s always a fun little creative exercise for me to see how I can combine my favorite shaped glass beads like spikes or pyramids and two-hole lentils with my thrift shop finds. Morse Code Beaded Bracelet. This cool beaded bracelet made with round glass beads and stretchy cord contains a secret message – but only you know what it is! Morse code beaded bracelets are a fun way to share secrets with your friends, too. 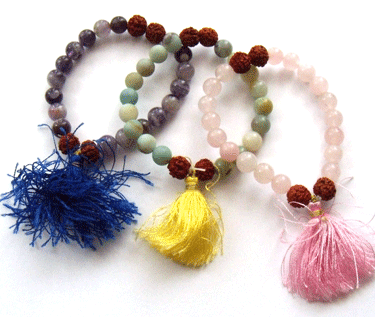 Want to try some more fun bracelet making projects with your kids this summer? Try these fun jewelry making techniques from professional art educator and jewelry artist Candie Cooper! In Stretch Bead Crochet, you’ll learn how to create fast and easy bead crochet bracelets and necklaces using easy-to-find materials. Even if you’ve never done bead crochet before, Candie shows you step-by-step how to make your own bead crochet chains. These bead crochet chains are the perfect way to use up bags of leftover or mismatched beads, and make for some funky beaded jewelry. Even kids can learn how to do these easy bead crochet chains in just a couple of hours! For those of us who love working with leather, Candie’s Leather Cuffs: Start To Finish provides hours of inspiring, creative jewelry making techniques for working with leather. Take those plain leather cuffs that you can find at your local craft shop or thrift shop, and watch and learn as Candie shows you how to customize them using colorful paints, pigments, and stains. You’ll also learn how to add surface embellishments using some of the hottest trends like rivets, cords, and yes, beads! Best of all, both of these videos are available as instant downloads in the Beading Daily Shop, so you can be watching and creating in no time. 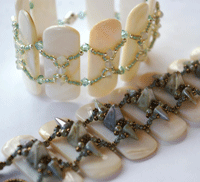 Do you have any fun bracelet making projects planned for this summer? Leave a comment here on the Beading Daily blog and share them with us!